A warm welcome awaits you in Whangarei, where yacht owners can find a full range of marine services and supplies, boatbuilding and repairs and a chance to explore our famous New Zealand landscape and coast. Over the years Whangarei’s businesses have grown both in size and in the range of skills they provide to enable them to offer a very comprehensive range of professional services to the superyacht industry. Whangarei is justifiably the market leader for cruising yacht refits in New Zealand. In fact more than half the cruising yachts that arrive in New Zealand choose Whangarei as their re-fit destination. The town is small enough not to be cursed by big town disadvantages such as gridlocked traffic or pollution but big enough to provide a cosmopolitan range of restaurants, bars and nightlife. Reva's on the waterfront at Town Basin is one of the best known crew meeting places in the Pacific. Whangarei boasts considerable advantages for refitting. Although only a very short flight from Auckland, land prices in Whangarei have remained reasonable so overheads are low, allowing our companies to remain highly competitive with other refit and new build destinations. In addition to the world class refitting and repair facilities, our marine businesses have built some exceptional and innovative superyachts. Our craftspeople are in very high demand throughout New Zealand's superyacht industry. Whangarei's reputation is enviable, not just for the quality of work undertaken, but also because Whangarei is a great place to live whilst the work is being completed. Search our directory of local businesses that have the experience and expertise needed for any repairs or a full refit of your yacht. 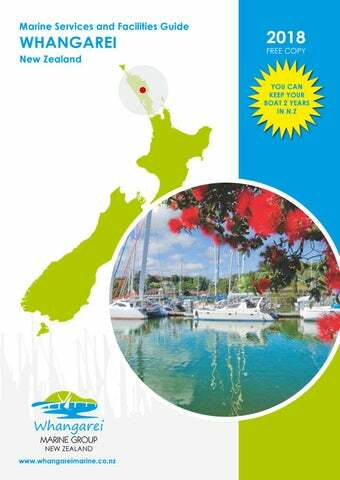 The Whangarei Marine Group has compiled a comprehensive guide to local marine services and facilities, with local maps and information. The upper harbour is accessed by a bascule bridge. Access is free and here is the process for getting the bridge to open.